John Byrne enjoys a fitting tribute to Irish football legend John Giles, the subject of the RTÉ One documentary Giles. There was so much to savour in this compelling and almost flawless documentary it's hard to figure where to begin. So I'll begin with John Giles, the subject matter of the eponymously titled Giles. Ask anyone who knows anything about Irish football and his name has to surface, and sooner rather than later. And unlike today's celebrity footballers, Giles was a meat-and-potatoes type who remained firmly grounded regardless of success. No messing, straight in, he's tackling himself from the off. "I never wanted to be a star," he says. "I wanted to be a great player." Mission accomplished, then. Like most footballers who made it in the full-time game in England during the 1960s, Giles came from a grainy, monochrome world where decrepit buildings, little education and lots of street football were the norm. Short trousers and snotty noses ran in families. Recalling how working-class life was in the 1940s and '50s, Giles explains that leaving school at 14 was the norm. Money was needed at home. But little John was different: he realised he had a gift. "I've known a lot of players who were gifted, but never realised it," he recalls, "and didn't make the most of it. And making the most of it is the important bit." Football was a big deal in Dublin in the 1950s. On the northside there was Drumcondra, and on the southside Shamrock Rovers. England might as well have been in outer space. Wandering around a now dilapidated Dalyer, Giles recalls: "Dalymount Park was our Wembley, really. This was the Mecca of soccer in Ireland." And being a child in inner city Ormond Square meant one thing to young Giles. "I was brought up in a soccer world." The thing was, though, that 'soccer world' was regarded as something of a foreign interloper by others. "I didn't consider myself Irish," he recounts. "I considered myself less than Irish, because of lay teachers and Christian Brothers. They were very anti-soccer, and I was known as a soccer guy. I got a bit of a hard time over that." But after legendary scout Billy Behan sent Giles to Manchester United, over on the ferry at 14 - "I'd a swam over" - the monochrome world of Dublin was replaced by the equally monochrome Manchester. Old Trafford wasn't exactly glamorous for an apprentice footballer back then. Following the Munich Air Disaster, when most of Manchester United's renowned Busby Babes were killed in 1958, Giles gradually progressed into the first team, but a couple of poor performances in key games saw him leave after the FA Cup win in 1963. 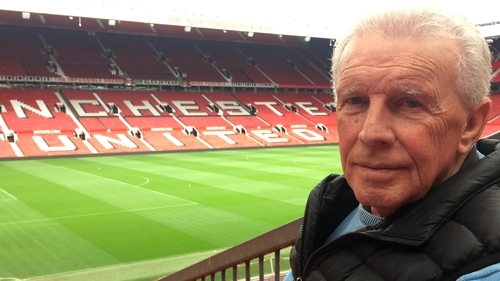 "Nobody leaves Old Trafford and does well," Giles notes. "Well, I'm going to prove that wrong." He adds that a big driving force in his life was proving Matt Busby wrong. Giles went to Leeds United, then an unfashionable club in the second division, and played a central role in making them one of the most successful - and unpopular - clubs in England. Following some footage of wild challenges, pitch fighting and the incomparable football writer Hugh McIlvanney slagging Leeds' win-at-all-costs attitude, Giles admits: "We were called a dirty team, and there was certainly an element of truth in that." The game was certainly a lot tougher back then. When Leeds boss Don Revie left for the England job, Giles was overlooked as his replacement, and was subsequently sold to West Bromwich Albion, where he enjoyed much success as player-manager. Then there are the Ireland years. Sadly, there's no footage of his debut game for the Republic of Ireland in 1959, but there are scenes from the memorable 3-0 win against the USSR at Dalymount. Happy, hairy days. There's also, of course, a look at his time as a football analyst at RTÉ, which is how anyone under 40 will remember him. Three decades after joining, he was retired. "Anything that's over after 30 years is sad," he offers, but admits: "I didn't intend making a career of it." As self-effacing as ever he adds: "People say it took RTÉ 30 years to find me out, so no complaints about that." Really, all he ever wanted to do was play ball. "Whatever gift I had, I've been true to that gift. I did the best I could. I think I made the most of what I had." The only negative I'd have about this excellent documentary is the omission of Giles' time at Shamrock Rovers, from 1977 to 1983. He spent six years at the club as player-manager and then manager, producing some excellent players such as Jim Beglin, Liam Buckley, Alan Campbell and Pierce O'Leary. Okay, he didn't achieve the success he desired, but it was brave and unselfish of him to turn his back on English football at that time and revive a then-dormant Rovers. His efforts also laid the groundwork for the Four-in-a-Row team of the mid-1980s. So even in relative failure John Giles was a success. What a man.